If you haven’t, now take a look at the detailed proofs for the Monty Hall problem offered in the Wikipedia article. The ‘standard assumptions’ on host behavior apply as in the original article. The Monty Hall problem, based on a TV show, became famous in an ‘Ask Marilyn’ Parade column for confusing more than a 1000 readers with PhDs. It has been written about at length in Wikipedia (1) but we can show that it is easily figured out by using what we might call ‘reverse thinking’. Most explanations tend to be counterintuitive and long. First though, what is the problem? Suppose you’re on a game show and you’re given the choice of three doors to open. 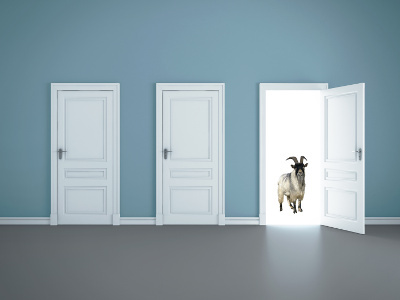 Behind one door is a car; behind the others, goats. You pick a door, say No. 1, and the host, who knows what’s behind the doors, opens another door, say No. 3, which has a goat. He then says to you, “Do you want to pick door No. 2?” Is it to your advantage to switch your choice? Many observers think that after the host has opened one door there remain just two doors each with a fifty-fifty chance of having the winning car. As a result, there appears to be no advantage in switching. Now that your are thinking about the probabilities of a winning solution, let’s stop and take another look. Note that at the outset everyone has a 2 in 3 chance of choosing the wrong door. After you have chosen either wrong door the host then has no choice but to show the other wrong door thus identifying the winning door, which you should now switch to. So switching wins every time, i.e. 2/3 of the time. For the 1/3 of the time in choosing the right door switching loses every time, i.e 1/3 of the time. So focusing our thinking on the wrong door easily shows that switching is the best strategy and wins 2/3 of the time. It’s that simple. By looking at the wrong doors we are reversing our thinking away from looking at probabilities of which might be the right door. We like looking afresh at a problem from a different angle and the new insight it might bring. In this example we looked at what wasn’t the winning door to allow the winning door to reveal itself! We like to think that when we bring such an approach to web-oriented business problems we are often similarly rewarded.